The rigid bar ABC in Fig. P-268 is pinned at B and attached to the two vertical rods. Initially, the bar is horizontal and the vertical rods are stress-free. Determine the stress in the aluminum rod if the temperature of the steel rod is decreased by 40°C. Neglect the weight of bar ABC. 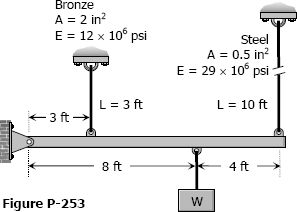 A steel rod 3 feet long with a cross-sectional area of 0.25 in.2 is stretched between two fixed points. 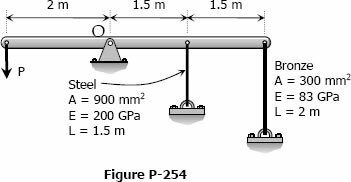 The tensile force is 1200 lb at 40°F. 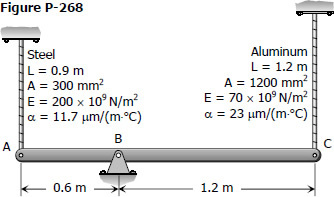 Using E = 29 × 106 psi and α = 6.5 Ã— 10-6 in./(in.·°F), calculate (a) the temperature at which the stress in the bar will be 10 ksi; and (b) the temperature at which the stress will be zero. The assembly in Fig. 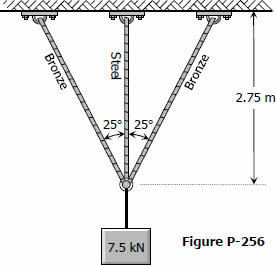 P-242 consists of a light rigid bar AB, pinned at O, that is attached to the steel and aluminum rods. In the position shown, bar AB is horizontal and there is a gap, Δ = 5 mm, between the lower end of the steel rod and its pin support at C. Compute the stress in the aluminum rod when the lower end of the steel rod is attached to its support.